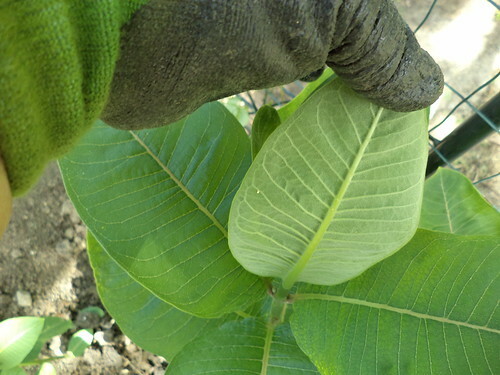 While weeding the south side bed by the arbor, I looked at the underside of the leaves on the milkweed plants which had sprouted in that area. There is a very small white dot on the underside of this leaf. I got excited. This could be an elusive monarch caterpillar egg. I have seen plenty of butterflies but no caterpillars. I know the eggs are hard to find so I left this and dashed inside to google it. It seemed like a winner. I was so excited. First a caterpillar. Then a chrysalis. 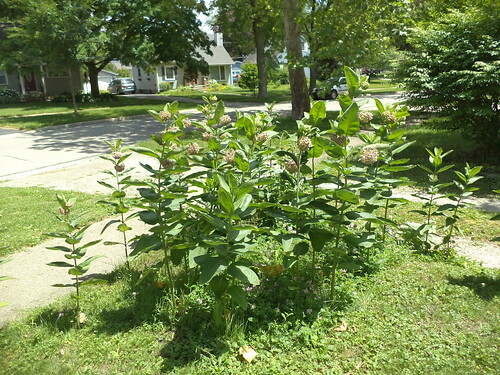 The milkweed is blooming in the southeast corner of the front yard. Every year, a few more plants show up. It's overgrown, and, living in suburbia, yards which are not golf course perfect, can be flagged for code violations. But everyone seems to understand this is monarch territory. They can pull their milkweeds, run them over with a lawn mower. Mine are there for this endangered butterfly. So far, no sign of a caterpillar, anywhere. The small white dot has vanished. Bees are circling the flowers, but if there are any caterpillars, they are where I can't see them. I'm disappointed, to be sure, but I'll nurture these plants and hope I see something over the summer.